What a difference a month makes! In Bottoming Out (321Energy, September 10, 2008) I predicted that oil prices would settle in the $75-$80 range (NYMEX WTI monthly average) by 2010 or in 2009 if the economy continued to decline. Today's bargain price for a barrel of oil is about $73. I still believe the longer term 2009 price will fall into line with my original prediction when OPEC makes deep production cuts and the current credit crunch begins to ease. A recession in the United States is in full swing even as we wait for lagging government indicators to catch up with the Conference Board and reality. Our oil consumption is a proxy signaling levels of economic activity. The IEA's September Oil Market Report (OMR) states that "the correlation between economic activity and oil demand is very strong. Between 1983 and 2007, US GDP grew by 3.2% per year on average, while demand expanded by 1.1% per year on average over the same period" (graph below). U.S. oil demand is way down. Last week's EIA status report shows that "product supplied" (actual consumption) in the United States fell to 18.660 million barrels per day (b/d), the lowest level since July, 1999 (xls data series). This week's report is even lower at 18.614 million b/d. Dramatically lower oil consumption is yet another sign of our ailing economy. The plunge in demand does not betoken a response to high oil prices or a sudden miraculous increase in our energy efficiency. The 4-week moving averages show that product supplied fell from 20.292 million b/d in the last week of August to 18.660 in the first week of October, a fall of 8% in a mere 6 weeks. This dip occurred after oil prices, which averaged about $133/barrel (NYMEX WTI monthly) in both June & July, fell to $116.61 in August and then further to $103.90 in September. No doubt high oil prices have prompted Americans to curtail some of their oil consumption. We would also expect some lag between the high summer prices and falling demand as consumers take the time necessary to make adjustments. Some of the downturn is due to regional spot shortages following the hurricanes. However, the short-run price elasticity of gasoline demand (discussed here) could not possibly be as large as the demand swan dive indicates. The price elasticity of diesel fuel demand is probably even lower. Distillate fuel oil demand was 6.9% below the 2007 level in the latest EIA report, which points to a decrease in trucking volumes. Jet fuel was down 6.4%, signaling a similar fall in air travel. Sagging U.S. car sales, even where people choose more fuel-efficient vehicles, could not have had much effect in such a short period of time. "The research firm [Global Insight] predicts U.S. new-car sales to total 13.6 million this year, a 16 percent drop from the 16.1 million vehicles sold in 2007." Finally, rising jobless claims must be affecting vehicle miles traveled because, as CNN Money's Steve Hargreaves helpfully points out "unemployed people tend to drive a lot less" (Oil Prices: Buckle Up for a Wild Ride (October 8, 2008). The IEA's September Oil Market Report states that "The oil price doubled in real terms between 1978 and 1980, leading to a 9.9% oil demand contraction over that period." Despite the much lower energy intensity (energy consumption per GDP) in the United States now, which is supposed make oil use less sensitive to economic conditions, demand has fallen 8.9% compared to the 2nd week of October, 2007, with most of that coming in the last 7 weeks. Such is the depth of the economic slowdown in the United States. What about the longer term outlook for the oil markets? 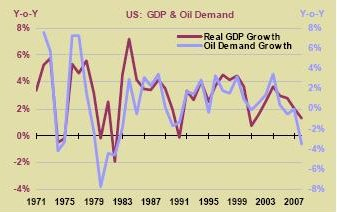 I assume the correlation between GDP growth and oil demand (graph above) since 1983 will remain largely the same in the medium-term (2009-2013). Making a significant increase (>10%) in our oil efficiency without our sacrificing economic health is a gradual process that takes a decade or more unless society makes a concerted effort along those lines. Achieving greater efficiency also depends on the pace of new car sales, which depends in turn on the strength of the economic recovery. So we must look at the economic forecasts to assess how much of a comeback OECD oil consumption will make after current recession. The International Monetary Fund (IMF) has released their World Economic Outlook (October, 2008). The advanced (OECD, without Eastern/Central Europe) economies are forecast to recover quickly after 2009 with real GDP rising to 3% and then falling to 2.5% in 2013 (graph below and Table A1 Summary of World Output, p. 259). 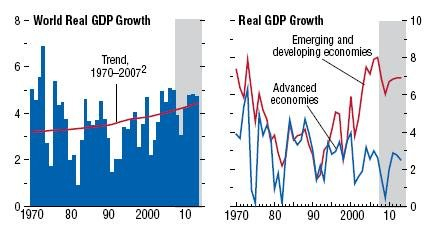 The emerging economies, which have clearly demonstrated higher output growth since the mid-1990s, slow down during the recession but recover a bit to achieve a growth rate of 6.9% by 2013. Many observers don't believe the IMF's optimistic forecast. In How to Get Growth Back on Track, Michael Mandel casts doubt on whether the output growth recorded previously in 2004-2007 was real, citing stagnant real wages and salaries, Americans' over-reliance on credit and dubious worker productivity figures. This view will come as no surprise to those who read Our Phony Economy (ASPO-USA, May 21, 2008) or are familiar with the work of Kevin Phillips. The main product and export of the United States now appears to have been mortgage-backed collateralized debt obligations. China remains the key to all future oil consumption scenarios. The IMF expects China to keep growing, and so do the Chinese (The Guardian, October 10, 2008). The forecasts by the Chinese Academy of Social Sciences (CASS) are more optimistic than those of the IMF, which said this week it expects 9.7 percent growth in Chinese gross domestic product this year and 9.3 percent in 2009. "The financial crisis and the world economic slowdown will have an impact on us, but they won't change the fundamentals of the Chinese economy," Chen Jiagui, vice-head of CASS, told a conference. China's GDP expanded 10.1 percent in the second quarter from a year earlier, down from 11.9 percent in all of 2007. "The slowdown in 2008 and 2009 should be read as a normal fluctuation in growth. There is not enough evidence to say that an economic downturn is taking place," the think-tank said in the report. Domestic investment and consumption would keep the world's fourth-largest economy on track, the report said. I believe anemic growth in the OECD countries along with the continued strong growth forecast by the IMF in the emerging nations is the most likely scenario in 2009-2013. As I discussed in Bottoming Out, non-OECD oil demand will slow a bit during the current downturn but should remain robust in 2009 and thereafter. American oil demand is falling more precipitously than I had imagined possible even a month ago, so demand growth in the developing world (the BRIC countries, the Persian Gulf) will not completely offset falling consumption in the OECD in the next year or so. American oil consumption is also likely to rebound some from its current level in the coming months. then the implications for the U.S. and the world's other advanced economies are enormous, and it is to this I now turn. The IEA's Oil Market Report discusses the consequences of the decrease in U.S. oil consumption. As oil demand continues to shrink in the OECD as a result of adverse fundamentals – the economic slowdown and the high oil price – there is ongoing debate on whether this loss will be permanent or temporary – i.e., whether demand has been ‘destroyed’ or merely ‘suppressed’, notably in the US, the largest OECD (and global) oil consuming country. Although, at first glance, historical evidence would lend some credence to the ‘suppression’ view, the ‘destruction’ case may be more persuasive and points to profound long-term consequences. The 'suppression' argument relies on what happened after high oil prices following the oil supply shock of the late '70s and early '80s led to a demand crash. After 1983, an increasing global oil supply supported rising OECD demand, a trend that continued more or less uninterrupted until 2006. This cyclic view depends on the idea that a similar pattern will re-emerge this time, with lower oil prices stimulating demand again after the current recession. 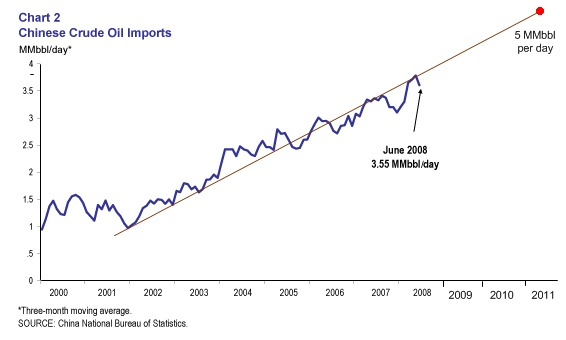 This view assumes, contrary to the supply data since 2005, that oil production can respond to demand as required. The ongoing and permanent realignment of global oil consumption (graph below) is now accelerating. 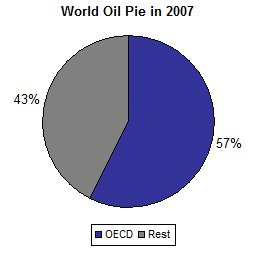 The OECD's share of the oil pie was 62% in 1990 but only 57% in 2007. Following current trends, oil demand in the developing world will make up about 46% of global oil consumption by 2011, a substantial redistribution of who gets to consume the available oil. 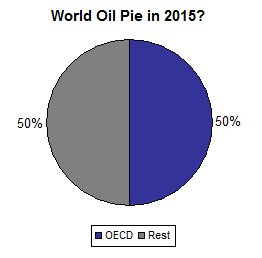 And by 2015, the non-OECD share may be closing in on 50% (graphs below). For example, once China is consuming 9 million barrels per day in 2011, they will be loathe to give back any of that share to the world market, even if government fuel subsidies are lifted in the future. The same is true of Saudi Arabia, Russia or India. In a future price competition for oil between wealthy China and the debt-ridden United States, who would you place your money on? In the past a rising tide lifted all boats. 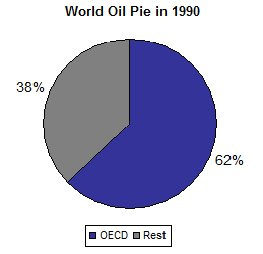 The oil pie was much larger in 2007 than it was in 1990, which left room for growth for all oil consumers. That won't be possible this time around if a peak in the world oil supply occurs in the medium-term. Thus we come to the real meaning of the IEA's "continued strength of demand growth outside the OECD and [oil] supply constraints." Eventually, every barrel of oil will be "allocated" according to who is using what, and only competitive price wars for oil will change the established arrangement, although the specific price/demand dynamics are sure to be complex and, from our vantage point in 2008, unpredictable. The IEA states that "sustained high prices and sluggish economic activity ... will continue to support the current wave of structural adjustments." Yes, that's the hope, but the writing is already on the wall if my argument is correct. 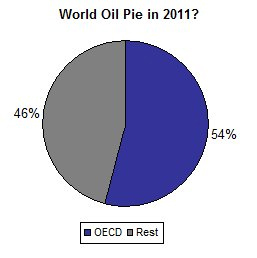 Whatever amount of oil we're consuming in 2011 is likely to be the most oil we're ever going to get to use. We will be forced to make structural adjustments or suffer the economic consequences. I don't believe the full implications of this accelerating structural shift in who consumes the world's oil have been understood in the United States, the European Union, Mexico, Korea, Japan, or by the IEA itself. Non-OPEC supply had been expected to increase in the second half of the year after declining by almost 300,000 bbl/d during the first half of 2008 compared with year-earlier levels. However, a series of supply disruptions, especially the closure of the Baku-Tbilisi-Ceyhan oil pipeline and the impacts of Hurricanes Gustav and Ike upon the U.S. Gulf of Mexico, led to a revision in this Outlook. As a result, non-OPEC supply is expected to decline by about 115,000 bbl/d during the second half of 2008, compared with the year-earlier level, and consequently non-OPEC supply growth in 2008 is now expected to be negative for the first time since 2005. The 2009 growth in non-OPEC supply of 730,000 bbl/d is expected to largely meet the anticipated increase in global consumption, barring delays in new projects and unanticipated disruptions. 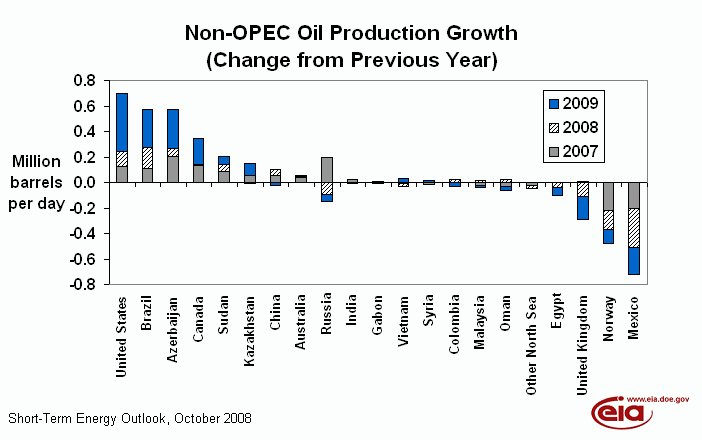 The United States, Azerbaijan, and Brazil represent the bulk of non-OPEC supply growth in 2009, although some of the growth in two of these countries simply represents a return to normal production conditions. Let's put this in perspective. When I wrote These Are the Good Years (ASPO-USA, February 20, 2008), the EIA was forecasting that non-OPEC production would grow 0.9 million b/d in 2008 and 1.5 million b/d in 2009. At the time, I cut the EIA's forecast in half (over both years). When I published Peak Oil Is A Done Deal, the EIA still expected growth of 230,000 barrels per day in 2008 and 830,000 in 2009. Now, the EIA reports that non-OPEC production declined in 2008, partially due to the BTC and hurricane disruptions, and will only grow by 730,000 barrels per day in 2009, some of which "simply represents a return to normal production conditions." How will lower oil prices affect the gloomy non-OPEC situation?1 It depends on the marginal cost of production for new projects. The average cost for the most expensive new projects -- known as the marginal cost of production -- is about $75-$80 a barrel, according to London-based analysts Bernstein Research. "In the long run we continue to believe that oil and gas prices will trend up in line with the marginal cost of supply," said Bernstein. "However, prices should continue to cycle between the cash cost at the bottom, $45-$50 a barrel, and the price of demand destruction, $110-$125 at the top." Examples of price-project dependencies are not hard to find. Concerning Jack/St. Malo in the ultra-deepwater Walker Ridge, Gulf of Mexico, Chevron Vice-Pres. Steven P. Thurston recently said "we believe we will find a commercial solution," but obviously a commercial solution depends on oil prices staying (well) above their break-even point. At the tar sands, new projects, not existing ones, will certainly be in trouble (Calgary Herald, October 17, 2008). As First Energy's William Lacey was quick to point out Thursday, oilsands operations did not shut down when oil hit $10 a barrel in 1998 and early 1999. "They will keep running, no matter what . . . unless there is a massive shift somewhere . . . these are not easy projects to shut down or start up. But it's the new projects like Fort Hills that we estimate need a $115 oil price to achieve a 10 per cent after-tax return, that are in the territory of now being uneconomic," he said. As to what the break-even oil price is for these operations, Lacey says the way to look at it is the cash cost per barrel to operate. The cash cost calculation typically includes operating costs, including expenses such as general and administrative costs, royalties and interest expense. A recent analysis by Paul Horsnell of Barclays summarized the precarious supply situation down the road. There is a strong asymmetry on the supply side in that quantities tend to respond faster to sharply lower than sharply higher prices. It does not take long at low prices for supply to be compromised right along the curve. Once projects are canceled or delayed, it can take a long period of higher prices before they start to move forward again. Our view is that sub-$90 per barrel, the world faces a serious supply side crunch as little as two years away. While all the attention is on demand, in the background credit conditions, liquidity preference and price uncertainty are such as to mean that large chunks are already falling off the supply profile for both oil and alternative energies. We would then tend to disagree with the view that a falling oil price is the main bright spot. If the source of the price fall is an expectation of a weaker global economy, and if it is just setting the world up for a more severe energy crisis, then that does not look like unambiguously good news. I would be remiss if I concluded this section without noting that the EIA's Outlook points out that U.S. "domestic oil production has been steadily declining since the 1970s and the 2008 projection for crude oil production falls under 5 million bbl/d for the first time since 1946." You read that correctly — since 1946. The dip below 5 million b/d is due to the hurricane disruptions, so it is only a temporary setback, but the this statistic should serve as a warning to America to sober up. Oil production above 5 million b/d will likely become a thing of the past after 2012. The sharp price rise to $147/barrel back in June also serves as a warning of Things To Come. Worse yet, as production outside of OPEC falters, our dependency on the cartel increases, which will not come as welcome news to the unenviable Barack Obama, who has pledged to get American off Persian Gulf and Venezuelan oil in 10 years. Perhaps he should worry about replacing Mexican imports and prepare for less oil from the tar sands, which "could be to the oil industry what sub-prime lending was to the banking sector." Shouldn't we welcome decreased oil consumption in the United States? Less demand will decrease our imports, lowering the tax on American consumers and shoring up our trade balance. To the extent that reduced oil use does not affect our economic health, implying a further decrease in our energy intensity with respect to liquids fuels, we should be happy with our ability to get along without the oil. But if reduced oil consumption in the U.S. after 2010 begins to cause economic hardship, impairing our ability to get back on our feet again, we should be quite concerned. Wars get started over this kind of thing. The available evidence so far, albeit admittedly anecdotal, suggests that US consumers are both expecting the oil price to stay high and the economy to remain subdued. Nevertheless, we have kept our US 2009 forecast largely unchanged until more tangible proof of these trends becomes available. If my analysis of our longer term oil consumption is correct, or nearly so, then we might view the next 3 years as a window of opportunity, our last chance to reduce our oil dependency through voluntary structural changes. Otherwise, all changes will be made under duress. These adjustments, in line with the new spirit of socialism, will have to be promoted, coordinated and largely paid for through federal policies that specifically target oil consumption. Unfortunately, there is little in Barack Obama's energy plan that indicates an appropriate level of concern, whereas ample measures are proposed to fight global warming. Alas, Democrats have never understood the oil industry and probably never will. Norway, Mexico, Russia cut production? That should be no problem! Norway and Mexico have been "cutting" production for years now, and Russia started "cutting" production this year.